I don’t remember any of the flight. I slept the whole way and in Miami I remember getting donuts but that’s about it. Once we got to the airport we got a taxi to the resort and were excited by what was waiting for us. We were staying at the Secrets St James in Montego Bay, Jamaica and it was far superior to the Cancun place we stayed with Aflac last year!!! our room was the perfect romantic get-away we needed! wouldn’t that mirror be awesome in our bathroom? I wish! Even though we both were in need of a shower we were also in need of some food and sun and those won over being clean. We grabbed some lunch from the buffet and I actually liked it!!! Score!!! The rest of the afternoon we just relaxed by the pool and dosed on and off in some chairs. A great way to catch up on sleep and sun! The worker guys were talking to me while Zach slept and they kept laughing and saying he is “fresh” Poor kid was in need of a Jamaican tan huh? The first night we were supposed to meet everyone for dinner at the French restaurant but we got the time change mixed up and were an hour late. Oops! We did enjoy the super yummy steak though and went to bed early then SLEPT IN the next morning. Actually, we slept in every morning. It was HEAVEN! this is our ONLY ice cream picture 🙁 It was good too but we liked ALL the food so much that we didn’t end up eating too much of it! 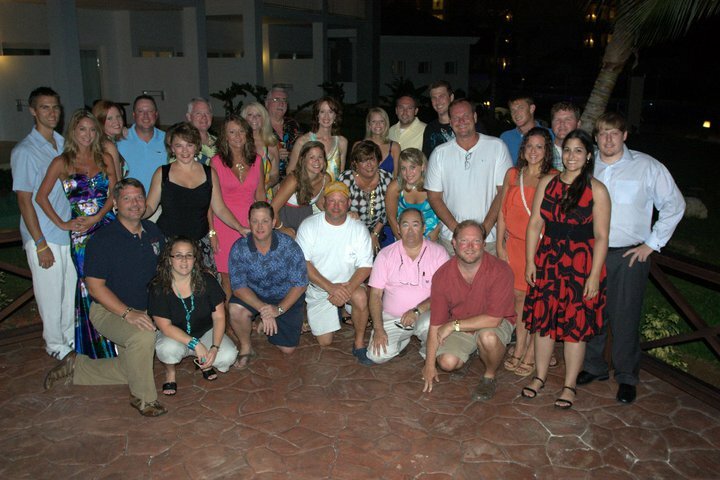 Before dinner we met with all the other Aflac people at a bar at the resort to mingle and take the group picture. We, obviously, weren’t drinking and when one of the bar tenders asked if we wanted a drink we said we didn’t drink and then this guy said he didn’t either! Turns out he and his wife are from Columbus and (duh) sell Aflac and are Christians and don’t drink. Um, score for us! We ended up going to eat with them and another Aflac couple at the Italian restaurant and we hit it off with them right away. Mrs. Becky (one of our Aflac friends) has a nice professional camera and she took several pictures of us at the Aflac meet-up so I’ll be sure to post them once she puts them up on Facebook. After dinner we headed back to the room for dessert because the all-inclusive included unlimited room service and my sheltered hubby hadn’t ever had room service before. Duh, we had to try it! Our second half of the trip is up next!